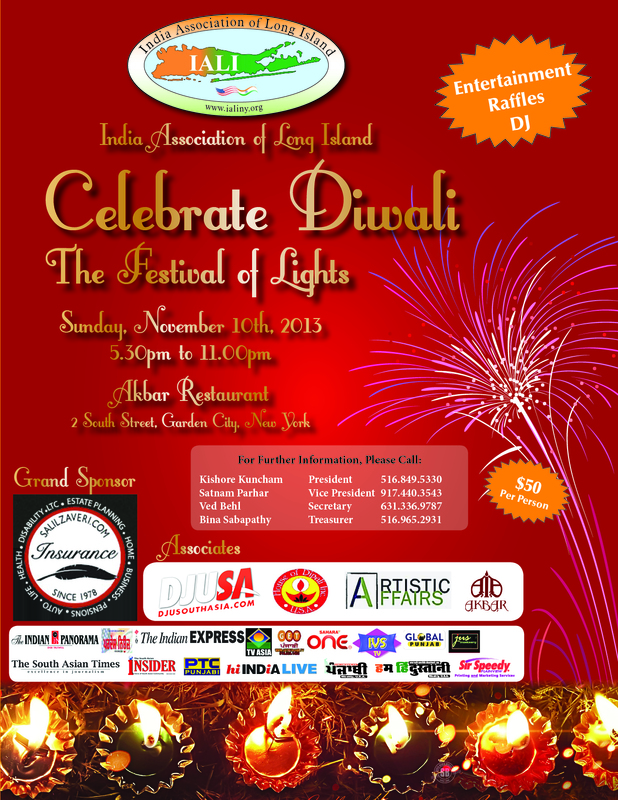 DJUSA - November 2013 Newsletter — Ultimate Sneaker Expo, NY Giants, Listerine, Pratham Gala, Las Vegas Wedding, DJ Chackoflavz and More! 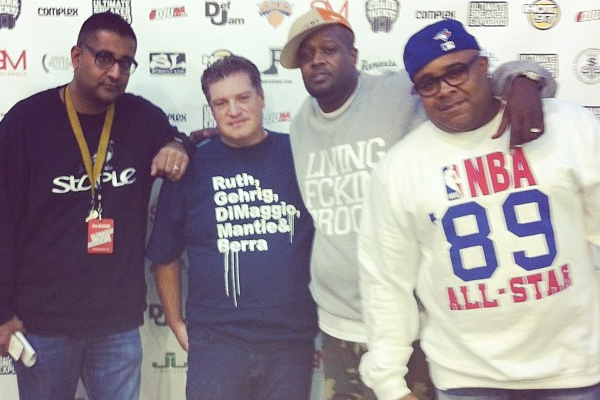 DJUSA and SM Event Group Experiences The Ultimate Sneaker Expo Success! In last month’s newsletter, we told you about the Ultimate Sneaker Expo 2013 in Long Island and now we’re going to give you the review! No one knew what to expect from the debut event, and it was a huge success. Over 2,500 people were in attendance to experience Long Island's largest sneaker and lifestyle apparel show. People of all ages lined up at the front of Ultimate 575 in Syosset, Long Island to make sure they got first dibs on the products on sale by retailers. DJUSA and its affiliate company, SM EVENT Group were onsite the entire day managing the event, working with the vendors and retailers, and ensuring event production was on point. 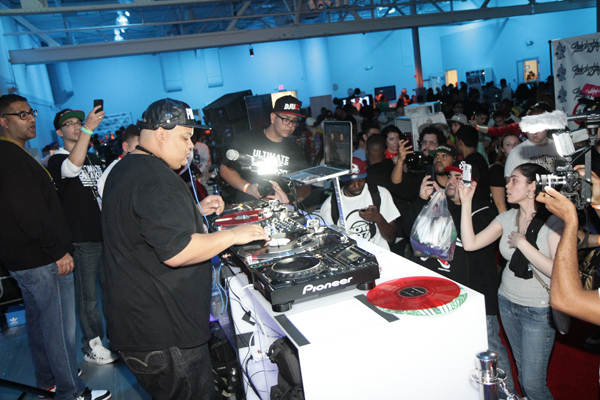 The show featured a mini light show and sneaker battles hosted by legendary DJ Clark Kent. DJ Fatfingaz, Ted Smooth, Juanyto, Trase, and DJUSA’s Chackoflavz played the hottest tracks and mixed on the turntables throughout the day. DJUSA’s MC Gino was on the mic to hype the crowd. To top it all, major sponsors including the NY Knicks was at USELI 2013 to give away tickets and brought out former player John Wallace to shoot some hoops with the guests. Def Jam also gave away tickets to the upcoming Kanye West concert at the Barclay’s Center and Hot 97 had giveaways all day long! DJUSA and SM Event Group would like to thank these major sponsors of USELI 2013 for making this debut event a success. Specials thanks to NY Knicks, Hot 97, and Def Jam! 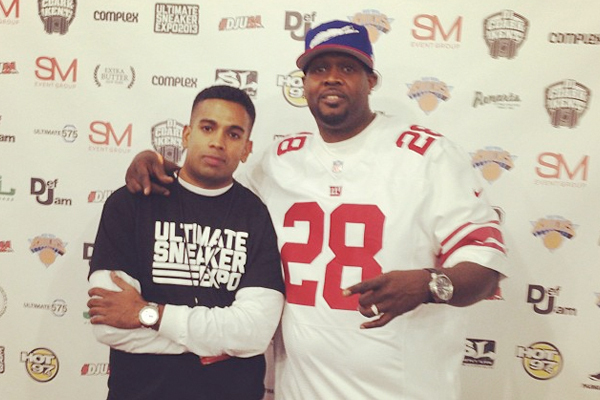 It was truly an event that goes down in the books so stay tuned for the next Ultimate Sneaker Expo Part 2 on April 26, 2014! Click here to check out all of the pics from #USELI2013! It was not any ordinary Monday as the NY Giants and Minnesota Vikings were schedule to play football at the MetLife Stadium in East Rutherford, NJ. 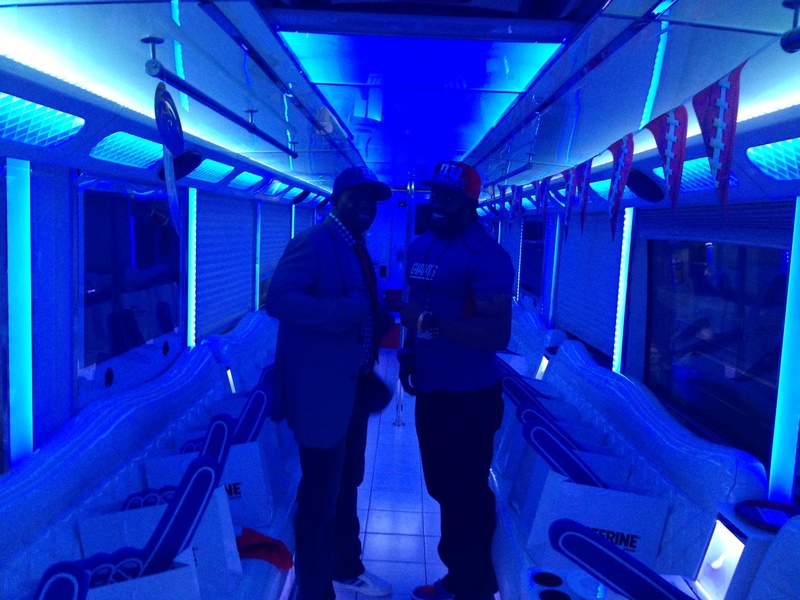 DJUSA was onsite for the Monday Night Football Tailgate Party for Listerine on two different buses headed towards the stadium. 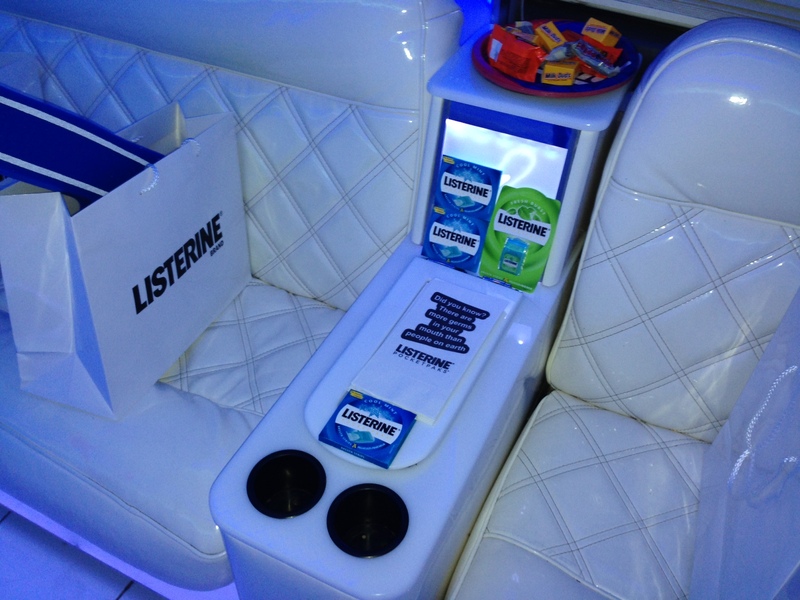 DJUSA’s very own MC Marco G and Freddie hosted their own bus and hyped the crowd with information about the Listerine Pocketpaks. 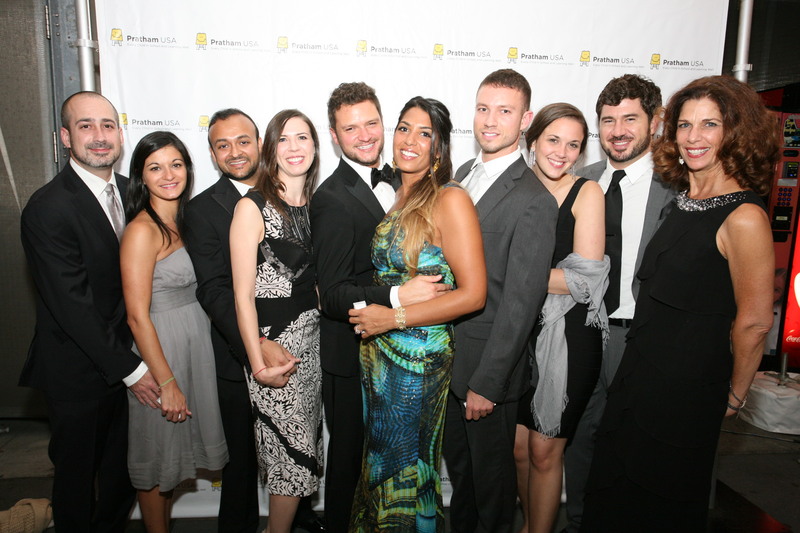 In October, DJUSA partnered with Children’s Hope of India and Pratham to support their 2013 Annual Gala in NYC. The goal of both organizations is to help the children in India. Children’s Hope of India, Inc. (CHI) support projects providing education, food, shelter, and health services to thousands of children living in slum communities across different states in India. Pratham is a non-governmental organization started in providing pre-school education to the children in the slums of Mumbai and has grown into the largest educational organization in India reaching 2.4 million children in 21 states. 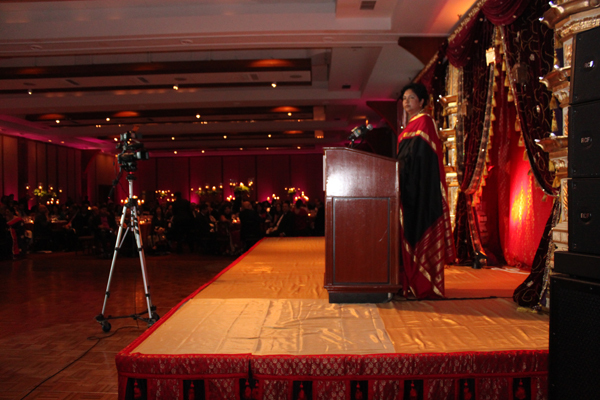 DJUSA was part of both galas hosted by CHI and Pratham, and helped to celebrate and honor the work done in India. Pratham’s Annual Gala 2013 took place on the USS Intrepid and DJUSA provided the step and repeat and centerpieces making this red carpet event even more memorable! 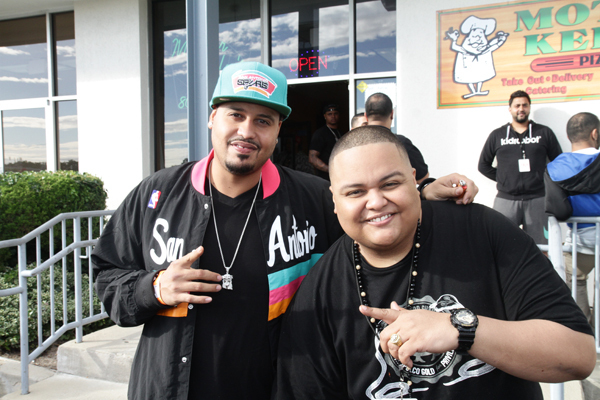 Check out pics from both events! 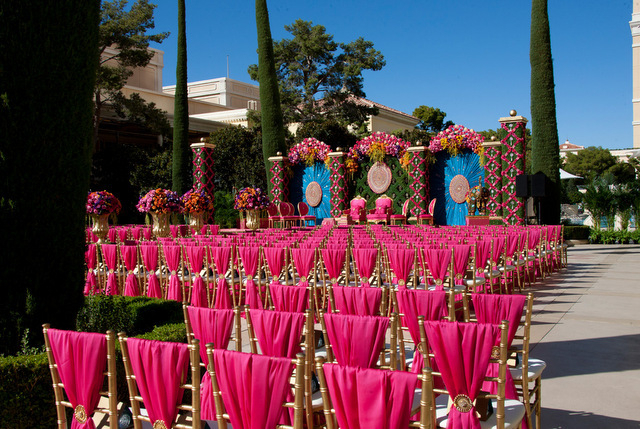 DJUSA’s DJ Sharad and team flew to Las Vegas to be a part of one of the most extravagant weddings held at the Bellagio Hotel. 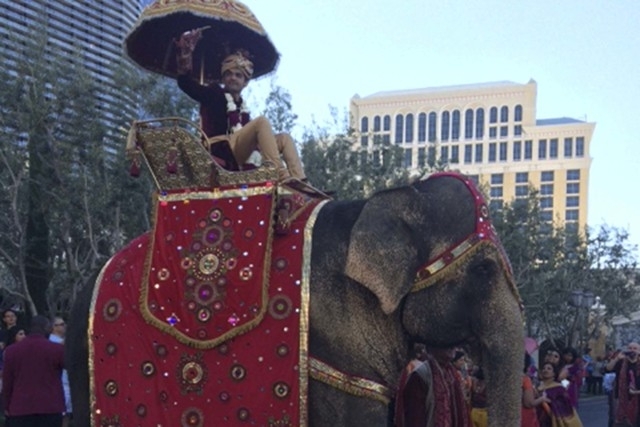 It may have been the first wedding on the infamous Vegas Strip that featured an elephant, but it surely wasn’t the first for DJUSA. After the last wedding in Vegas shown on We TV’s Platinum Weddings, DJ Sharad was ready to come to the Bellagio Hotel once again to rock another multi-million dollar wedding. The event had over four hundred guests and DJ Sharad kept the dance floor packed until 330am! 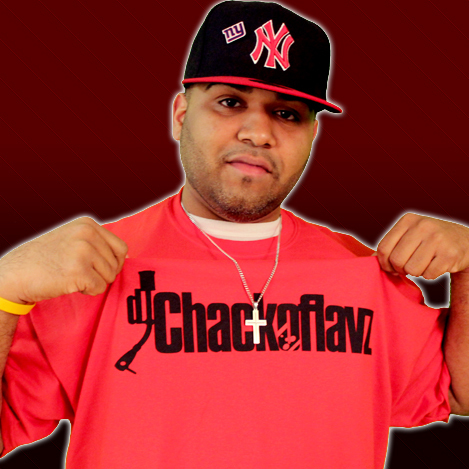 DJ Chackoflavz, NYC's Undisputed King has been rockin crowds in NYC and around the country for well over a decade. Highlights include opening up for Funkmaster Flex, DJ Enuff, DJ Skribbles, Das Efx, Busta Rhymes, Lord Tariq, Peter Gunz, Rob Base & DJ E-Z Rock...the list goes on and on. Robby has consistently rocked all of NYC's Hottest Venues as well as Mega Events around the Country including Fokana, SASA and so many more. His precise blends teamed with his insane style of hip hop scratches proves why he is truly NYC's King. 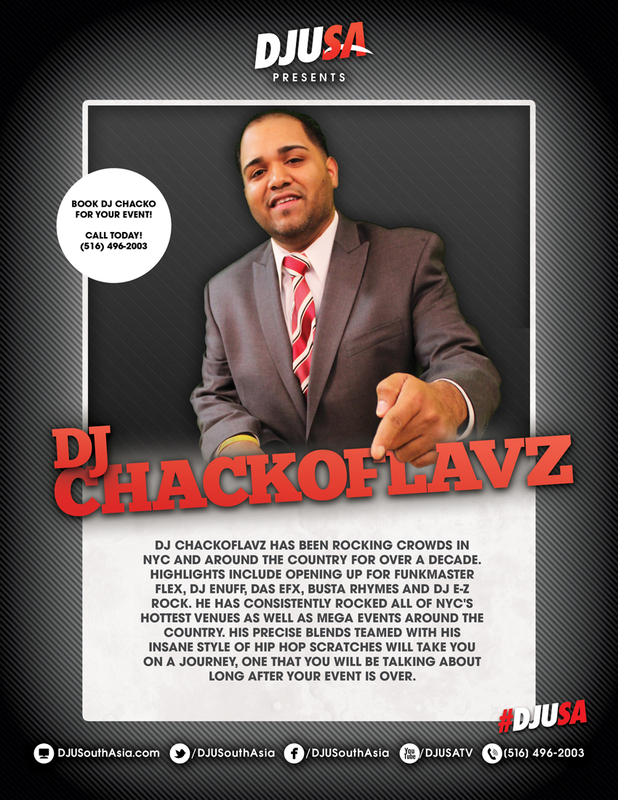 Get ready to be taken on a journey, one that you will be talking about long after your event is over... get ready for NYC's 15 year legacy DJ Chackoflavz. What was your start as a DJ in the entertainment industry? In the early 90’s, I attended a youth dance for the Indian Catholic Association of America at St. Boniface Church in Elmont NY, and DJ RED who at that time I did not know personally, was the DJ. Although DJ RED was spinning really well, I noticed he was very sick with the flu and could barley stand. I was friends with a few guys who knew DJ RED and offered to DJ so he could get rest, and from there a star was born! It became the RED & ROBBY show and we did it consistently from every college campus to every nightclub in Manhattan. Anyone that partied in the golden era of Desi parties in the 90's knows who we are and what we did because we were that good. I think we will always go down as two of the pioneers in the Desi DJ game. You've worked with Sharad even before he started DJUSA. Tell us more about the growing experience and why you chose to join DJUSA. Sharad was a kid that used to come to parties where I DJed and just stood by the booth to watch what I was doing. He was young, hungry and very ambitious. We had a heart to heart conversation and my mind told me following that conversation that he was a good dude. The end of that conversation I told myself whatever happens, I will always show this kid love because he was real with me. When I was younger there was a saying that went "real always recognize real" and this pretty much sums up my relationship with him. I chose to join forces with DJUSA in 2005. I had gotten married and had a son who was 3 years old at the time. I was the only one working and trying to make ends meet was very hard. I did not have the capital or the credit to buy expensive LED lights and screens. I began renting these things initially through Sharad. I then started booking MC's Marco and Max who are just great MC's and I said to myself this is a major thing that I lack in bringing to the table for my clients. As time went on we both realized joining forces was a win/win for everyone involved. If you follow me on Facebook Twitter or Instagram then you know I represent DJUSA as if it were my own company and not a company that I just work for. What do you think sets you apart from the other DJUSA DJ's? I come from a very musically inclined family. My song selection is very deep and very lyrical, and this is my father taught me. He only listened to music that had a lot of meaning to it so I grew up around it and I use that same knowledge and understanding of music. Usually 9 times out of 10 the parents who are at my events enjoy my song selection just as much as everyone else loved the dance sets. Everyone goes home happy. I thrive on making sure everyone goes home happy. What do you think has changed over the time you've been spinning? Technology has totally changed the DJ game around. It has its pros and cons and will be debated forever. I came up in time where you mixed by ear not by a waveform, bpm counter or a sync button. Some of these guys make mixes on software and sound like Tiesto or Hardwell, but put them on a set and they sound like a train wreck. Yet the same guys mix very well on Serato or Traktor with the bpm showing or the mixed in key setting. Give them two vinyls or two CDs, and they are totally lost. I am not a hater of technology because I used to lug around like 10 crates to parties with me where now I take a suitcase that holds my laptop and 1tb external HD. Sharad used to hate when I would show up to club parties with all those crates, and he would be like “bro do you really need all this stuff? This booth is tight enough as it is without all 12 of your milk crates.” I would say “hey man you never know don't not what to have something that I wanted to play. You guys can come with your technic bags filled with 50 records bro and that is not me.” I personally like the fact that I can take Hoobastank and blend it with a Jay-Z instrumental and technology has made the open form aspect an awesome addition to deejaying. Even after 20 years in this game I am still a student and love to hear other guys spin and what their creative minds brings to the table. What has been your favorite event working as a DJ as well as DJUSA and why? By far my most favorite event was Saturday June 5, 1999 at Deko Lounge in Binghamton NY. It is a memory I will take to the grave with me. I opened up for the legendary Funkmaster Flex who at that time was a DJ idol to me. Flex would not get on the set until he was paid in full. He was in the club for a good two hours at the bar with this entourage getting bottle service until the club paid him in full. I continued to play and let me tell you I had that place rocking from corner to corner. I looked over multiple times and saw Flex and his entourage bopping, dancing, and enjoying themselves to what I was doing. It was on that date that I knew I was built for this industry and no one could tell me otherwise. When Flex got in the booth he gave me a pound and said “great job fam” and I nodded my head and said “Its all yours Flex if you need me just say Robby to the DJ booth on the mic and I will be back here.” I went outside and was in awe that my idol just told me I did a great job, how many people can say that? 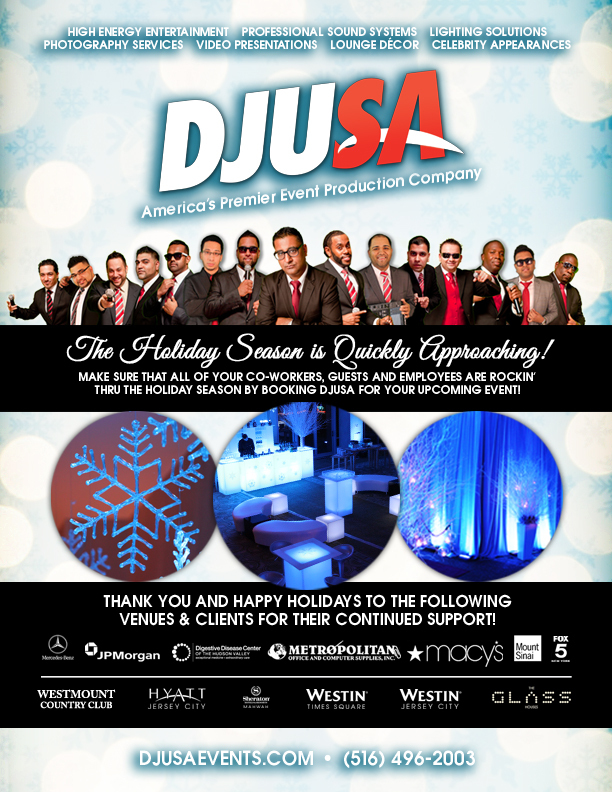 Nearly ten years later, DJUSA has worked private events with Funkmaster Flex where our team has provided the sound production. It is like everything has returned in full circle with DJUSA! Where do you think you see yourself in the next 5 years as a DJ? Anything can happen at anytime. Life is short and no one is promised tomorrow. In five years, my son AJ will be 18 years old. I will pass the torch to my son and help him in every way shape and form so he can be the best that he can be. My parents were not very supportive of my role as a DJ. They are first generation of Indians living in America who wanted their child to be a doctor, lawyer, or engineer, and not as a child not entertainment for friends and family. My son has my passion for music and loves the spotlight. My only hope is that he studies well and has options in his life, and I stress that every single day with him.